My three-year-old never ceases to have a collection of trinkets that accompany him everywhere he goes, whether it’s around the house, in the car or even when he goes to bed. Today’s assortment included a magnetic letter “J”, a plastic yellow connector for a building toy and a customer appreciation card for a bakery chain. And while these items may seem pretty trivial , they are the things he holds dear. He cherishes and protects them, and is eager to show them off to anyone interested. It got me thinking, I guess we do this as adults too. Maybe it’s our homes, vehicles, jobs, pets or entertainment systems. I personally love collecting a variety of memorabilia, and have a particular affinity for my ever-growing stash of Coca-Cola collectibles. Like my son and his trinkets, we like to show off the things we are proud of and naturally want to share about the things that tend to define us. All of this leads me to wonder, why am I not this passionate about the one thing that should be most important in my life? As you may have guessed, I’m talking about my relationship with Jesus Christ. If you are Christian, perhaps the same applies to you. Instead of beaming with joy about the earthly things we’ve bought or collected, why don’t we take every opportunity to share the Good News? I realize that in striking up a conversation, talking about your latest score on Ebay makes a better icebreaker than, “So, where do you stand spiritually?” But how often do we go the extra mile to eventually talk about what really should define our lives? Often times we never move past the idle chit-chat. Maybe, like me, sometimes it feels like your life is being less defined by the Holy Spirit and more by every other distraction that comes along in our busy lives. I believe that resolving this starts at home. I know I am supposed to be the spiritual leader of my household, but it is a role where so often I miss the mark. It’s so easy to get caught up in the things of this world and the busyness of life and put everything else on the back-burner. Daily devotions in some capacity with my wife and son should be a priority, along with prayer, and too often it isn’t. I can’t go out into the world and spread a message I’m not prepared to share. This has just been weighing heavily on me, and maybe it’s something you’ve been feeling too. As I write this, my son has long since drifted off to sleep, clinging tightly to his trinkets. As usual, he cherishes and protects them, and will be eager to show them off again tomorrow. Wouldn’t it be a beautiful thing if that was the way we all embraced our relationship with Jesus? On April 8, 2010, my wife and I received the devastating news that the baby she had been carrying since December had been diagnosed with two rare disorders, a cystic hygroma and hydrops fetalis, which would eventually take her life. On April 21st my wife wasn’t feeling the baby moving and, as feared, the ultrasound revealed that there was no longer a heartbeat. We entered our local hospital on April 22, and were discharged on the 24th, discouraged and angry that natural birth could not be induced. We were told that an invasive procedure would be necessary, and basically we would never see our child. We were persistent though, and by God’s grace a Christian doctor offered to give natural birth another try. On the morning of May 3, we were admitted to Evanston Hospital and that evening our daughter was born. It gave us a great deal of closure to be able to hold her in our arms and say goodbye. We named her Virginia Rae, a combination of her great grandmother’s and mother’s middle names. 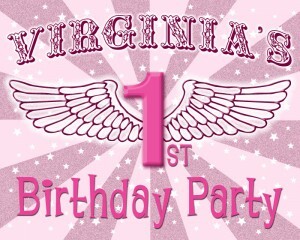 In honor and celebration of Virginia’s 1st birthday, we are planning to make a visit to an organization which walked beside us from the diagnosis, through the birth, funeral and since. The Haven Network is located in Rockford, IL and is a Christian perinatal hospice. Though they are a couple of hours away from us, they spent countless hours talking to us on the phone, and helping us through the process. They offer so many wonderful services for no cost, such as photography, keepsake items, bereavement literature, and spiritual support. We have received cards and letters from them on special occasions since Virginia’s passing that have meant so much to us. Handmade flannel receiving blankets approximately 20×20″. Solid soft pink, blue, or white in color. Wow, can you believe it’s that time of year again already? As you prepare for the holidays, maybe you have been thinking about all of those Christmas cards you need to send out. This year I am offering a one-of-kind assortment of 5″x7″ holiday cards with your favorite photo(s) and message. For just $0.97 a card you get your choice of glossy or matte 5″x7″ photo greeting cards. Order over 30 and they are $0.89 per card. Envelopes are included. Once a design has been purchased, it is no longer available, making you the only person sending out that particular style of card this Christmas. Please visit my Facebook page for the styles that are available. Then simply e-mail me the style number you desire, along with the digital image(s) and message/name(s) you would like on the card. I will e-mail back a design for your approval prior to printing. Well, come to think of it, it’s actually more like a lifetime. You see, I’ve been the artistic sort for as far back as I can remember. As a kid, there never seemed to be a shortage of paper and pencils, or coloring books and crayons. Birthday and Christmas presents were often art-related. I attended various summer art classes and used the family Tandy 1000 computer to create rudimentary digital designs – in 16 stunning colors. This continued into high school, where I took nearly every art class I could get my hands on and even took private lessons for a short time. But that’s where it ended, for a while at least. When I started college in 1993 I believed art wasn’t a “real world” career. Instead, I wanted to become a computer programmer, with lofty ambitions of creating gaming software. Those ambitions were quelled after my first semester, after it became painfully obvious that this was not my calling. Who thought I would have to know all of that advanced math? For lack of a better choice, I opted to major in communications instead, a decision that would eventually lead to my ultimate career path. I decided on the media concentration, which covered everything from journalism to broadcasting. It also offered elective art classes. I took some basic art classes which allowed me to be eligible for the introductory graphic design course. I excelled in this class and went on to take the follow-up course my senior year. That spring, my professor pressed me to enter a few of my pieces in Opus, our college’s fine arts festival. I never expected to win anything, so you can imagine my surprise when I was awarded first place in the graphic design category! You’d think this would’ve prompted me to look for a design position upon graduation but, alas, it did not. I graduated college with no job prospect in sight, and honestly no real clue what I wanted to do. I landed my first job later that summer and knew from the start that I wouldn’t make a career of it. I left there eight months later, feeling called into the graphic design field. I didn’t have a new job, so I worked from home earning money with sporadic freelancing. It was a great chance to not only increase my design skills, but I also taught myself HTML programming and site design during this time. It all paid off seven months later when I was hired for my first full-time graphic design position. 3 years later I left there for a senior designer position which I will have proudly held for 9 years this month. The years are just flying by! All of those years bring us to the present day, and the launch of the re:Design blog. The name relates to how I perceive the world around me. I’m an improver by nature. I tend to see the beautiful where it doesn’t exist. I see an ugly logo – I want to change it, a dated sign – I want to modernize it, even a rundown building – I envision what it can become. And I get excited with each improvement, even if it was done by someone else. I am regularly impressed and inspired by the talents of others! Thanks for taking a few moments to indulge me. My future posts might not all be as personal as this first one, but I’m hoping re:Design will be a place to share glimpses of my design process and what inspires it, along with a good mix of fun and practical articles on a variety of design-related issues. Heck, maybe this blog will even inspire you! Thanks for joining me as I strive to better our world with each and every design.